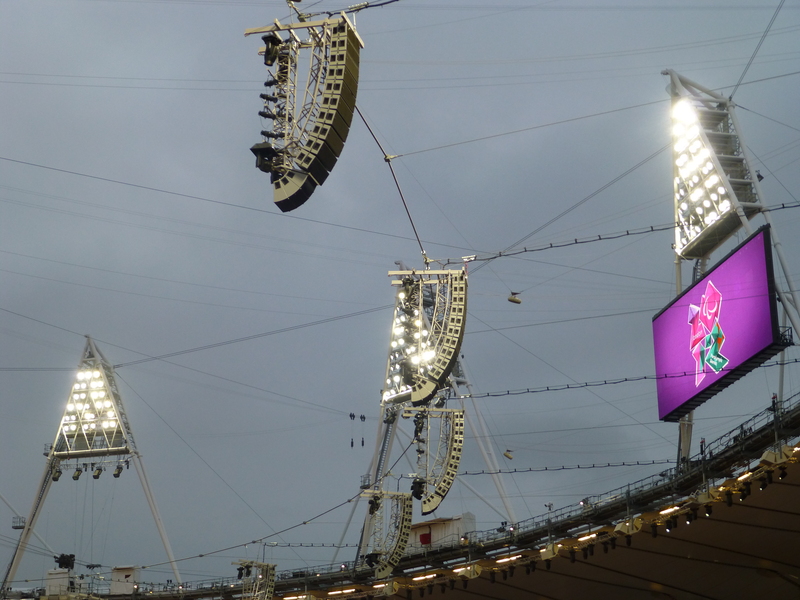 Last weekend my family and I paid two visits to the Olympic Park, to watch the Paralympic Games. 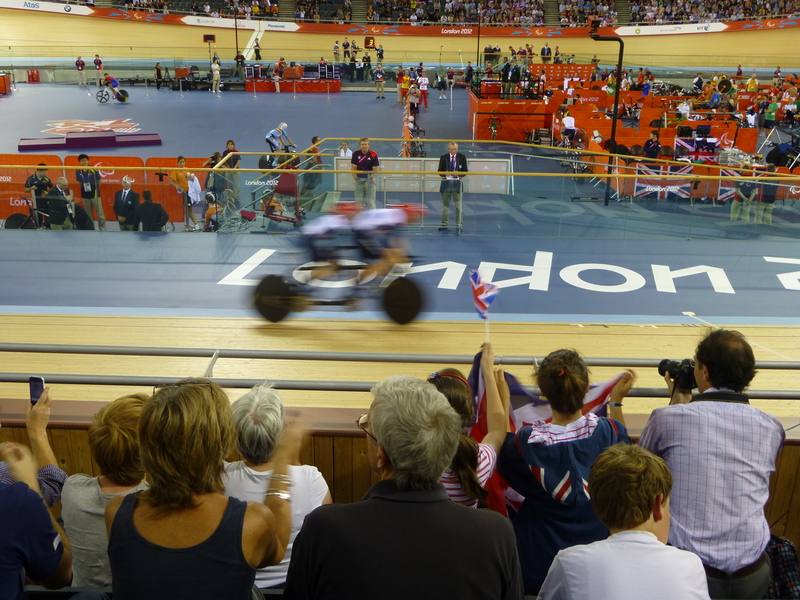 On Saturday morning we spent a few hours at the Velodrome, watching the cycling, and on Sunday evening we were at the Olympic Stadium itself to see the athletics. Both were brilliant. 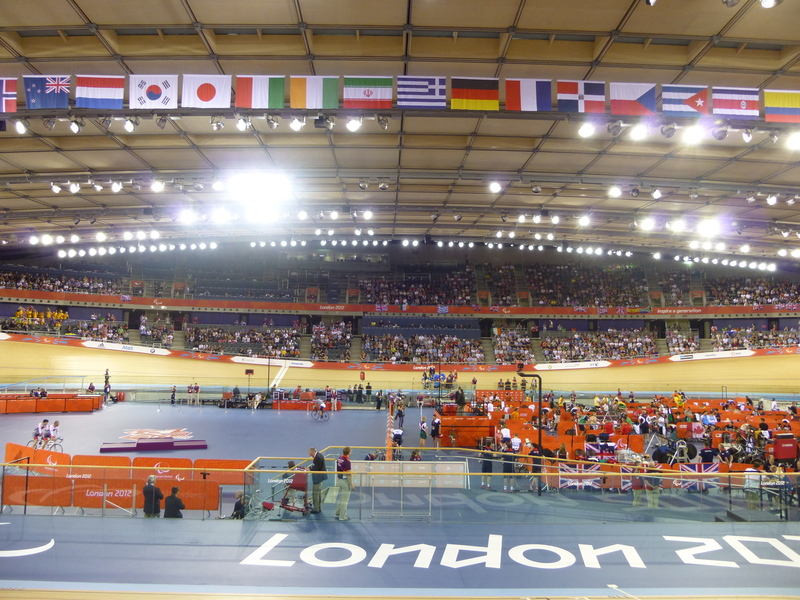 The Velodrome is a wonderful building, inside and outside. Affectionately nicknamed the “Pringle” its wooden curves make for the most distinctive architecture in the Park. Inside it is impressive too, though strangely it seemed a bit smaller than I’d imagined from viewing it on the TV. 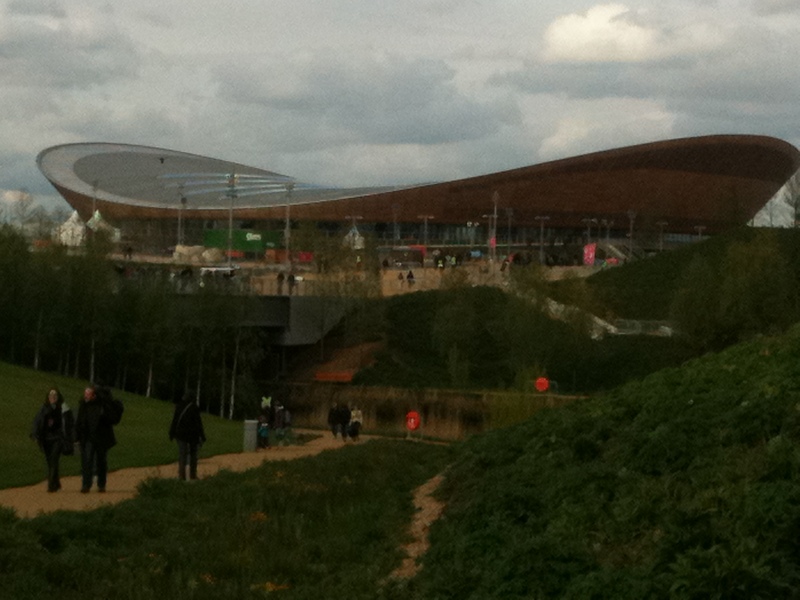 This is a shot I took back in May when we visited the park for London Prepares. 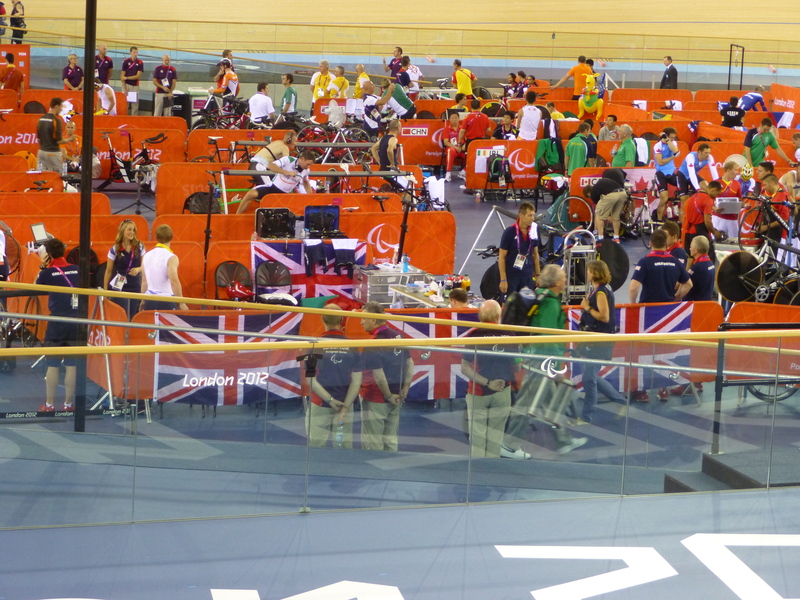 It’s a venue fit for heroics and the cyclists certainly obliged on Saturday morning. There was some extraordinary racing. 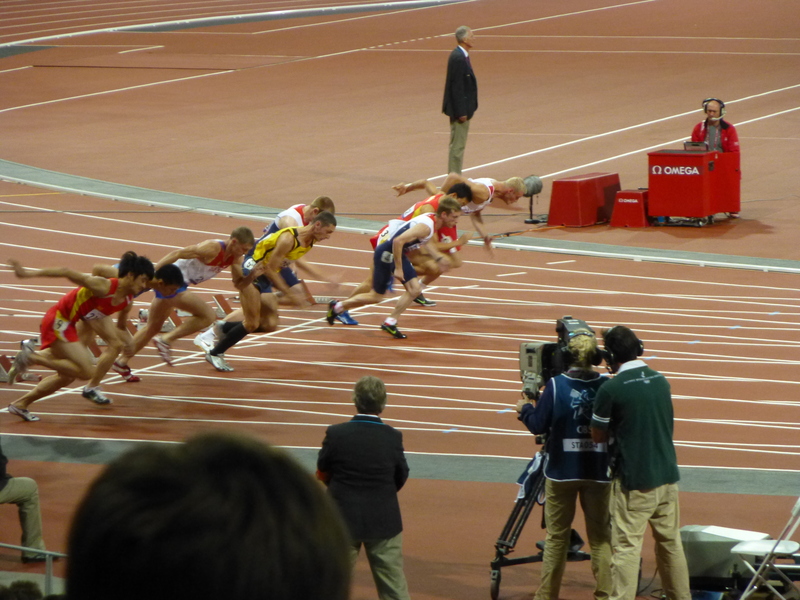 Now, you start at first observing what any particular athlete’s disability is and marvelling at how they can perform at such a high level; but very quickly that is all forgotten and it’s just raw excitement at the brilliant competition. 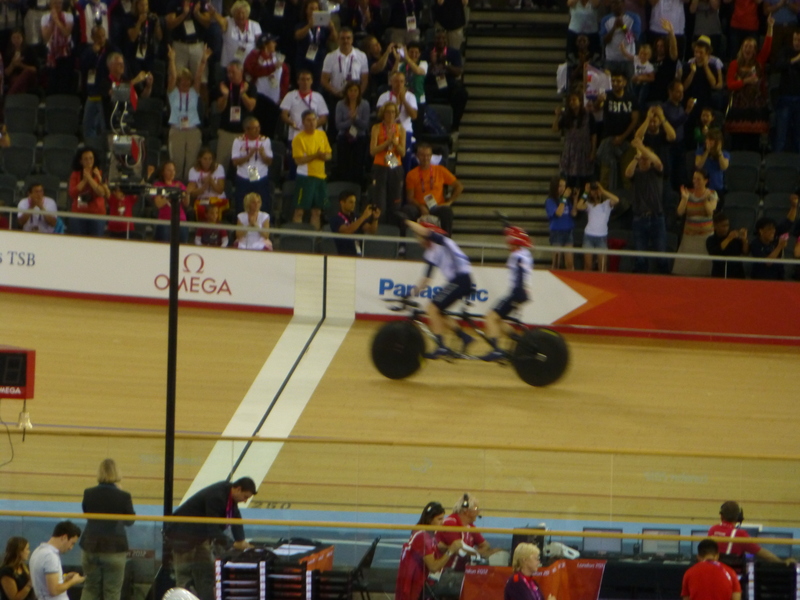 Readers of this blog will know from earlier Sportthoughts entries that I love the cycling, both on the road and in the velodrome, and the racing on Saturday was a real privilege to watch. Lots going on in the technical areas. 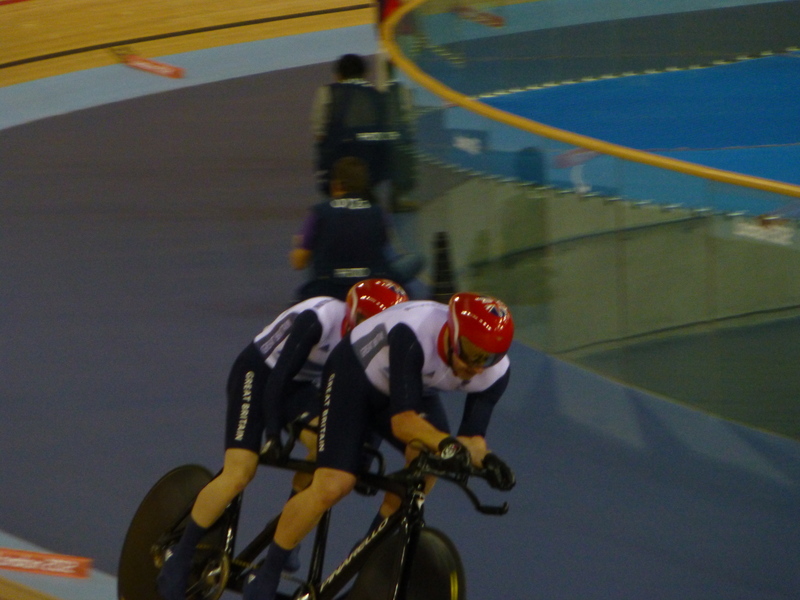 The first race was the men’s 1km time trial tandem race for visually impaired riders. It’s a two man race (obviously, being a tandem!) with a guide at the front and the main cyclist at the back. Quite how it’s designed so that the rider at the back determines the speed, I’m not sure, except that the cogs at the back wheel are much bigger than those that the front rider are pedalling through. There were two British partnerships in the race: Neil Fachie and Barney Storey and Anthony Kappes and Craig Maclean. They were the last two pairs to race, so were favourites. Faschie and Storey were amazing and the roar that drove them on was immense. You get this wave of sound as each part of the crowd urges them on as they pass that section by. So in the crowd it’s like a sonic Mexican wave. But for the riders it will be constant as they move around the track. It has to be inspirational. Faschie and Storey set the best time and waited for Kappes and Maclean They began… and stopped. The chain had slipped. After a tense interlude, it was deemed a technical fault rather than the riders’ fault, so they had another chance. Ready, steady… same happened. Two false starts and out. Gutting. But Fachie and Storey Gold. 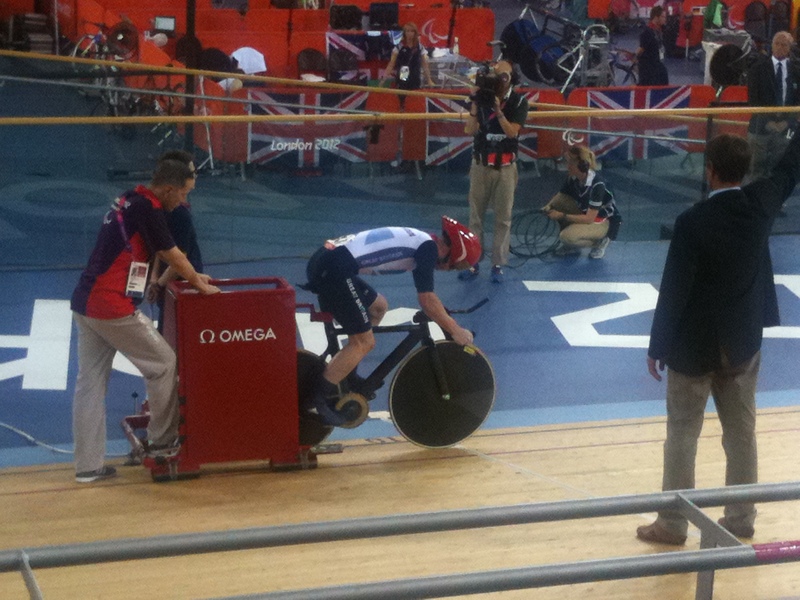 We then had two sets of heats for individual pursuit at 4km. 16 laps of the tracks. Different disabilities, C4 and C5. 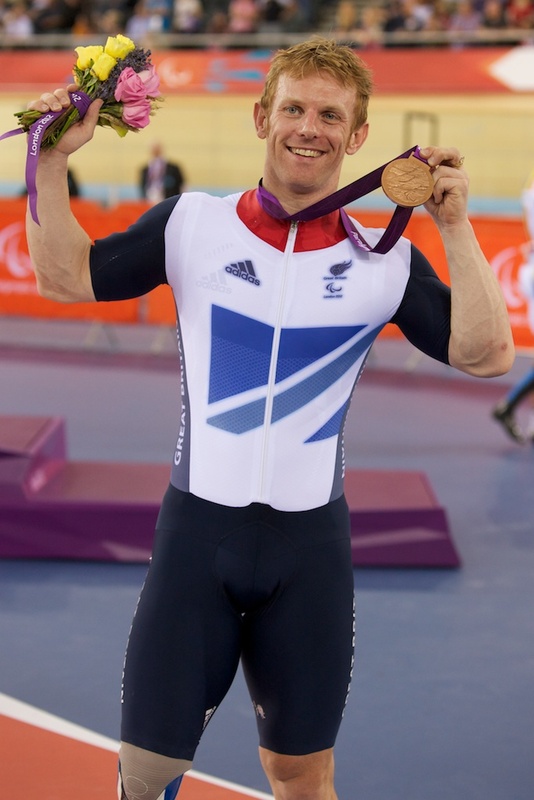 In the first set, C4, Jody Cundy, who the day before had dominated the media with his outburst after being disqualified in another race, raced to the third best time, which put him in the bronze medal race later in the day. Hugely popular. His parents and other supporters were sitting just in front of us. So proud. Sod’s law – camera battery ran out, but I’ve googled some images from the final later. It then dawned on me that I had the iPhone, from whence the next few shots come. 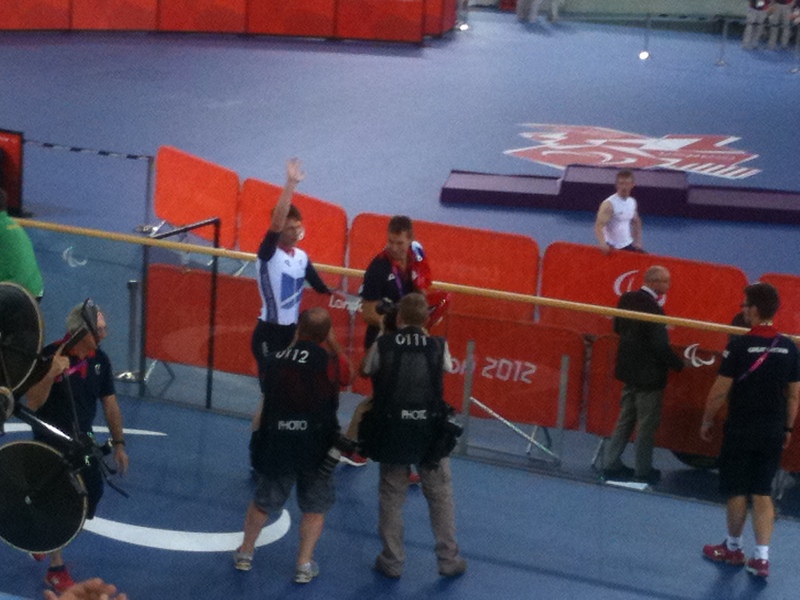 In the second set, the C5, Jon Allan Butterworth was GB’s hope. He lost an arm in the Iraq war. He was up against Irishman Cathal Miller. Plenty of Irish fans in the crowd. They set off. Slowly but surely (or is that quickly?) Butterworth caught up with Miller, who was one of the best himself. Eventually, Butterworth overtook his rival, and right in front of us. Amazing moment and frightening when you see how close the bikes were to each other. 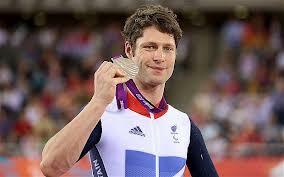 Butterworth went on to break the world record time, to a huge roar. 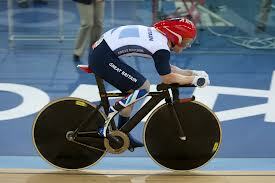 But in the last pursuit, the Aussie, Michael Gallagher, did even better and broke the world record again. Brilliant, and given a reception equal to any of the GB boys. That’s what the Olympics and Paralympics have been about. Partisan yes, but also appreciative of excellence from all participants. In the finals, Cundy got the bronze and Butterworth the silver. Cundy caught his rival after six laps and that was it, being a final. Butterworth went off fast, led for a good part of the race, but was then overtaken and well beaten by Gallagher. Credit to both. And those bikes – I’d love one! 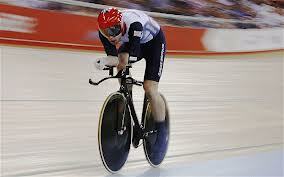 Jody Cundy winning that bronze. So, on to Sunday and the athletics. 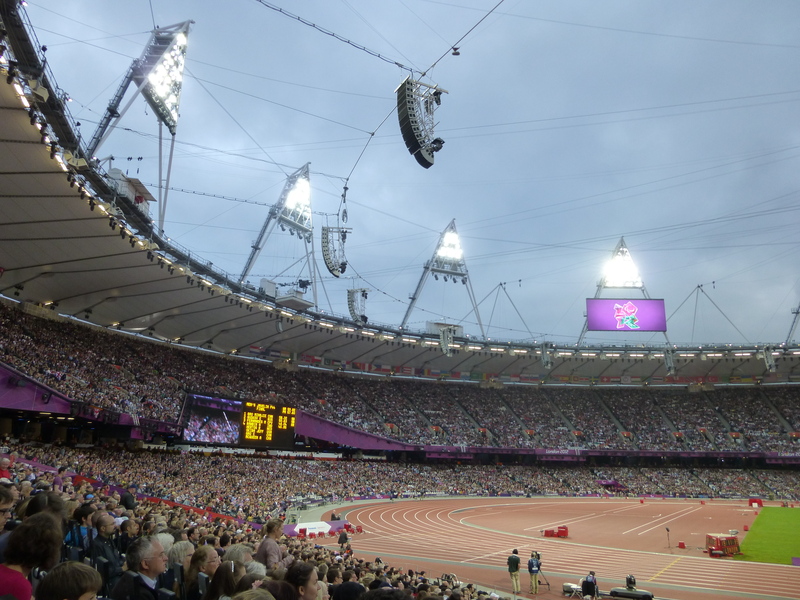 The stadium packed to the rafters, 80,000 people. Must be amazing for the athletes. I imagine the crowds they usually perform in front of are quite small. And then 80,000! Inspiring yes, but also pretty frightening! What we saw was a succession of astounding races. (And, this night, long jump, javelin and discus). Again you marvel at what people are capable of, given their disabilities, and then simply succumb to the excitement of the finishes. Just a few highlights here, biased as ever to GB. The visually impaired athletes run with a guide. So they’ve got to be pretty good themselves! But what a wonderful partnership. What trust and understanding it must involve. An inspiring example of teamwork. 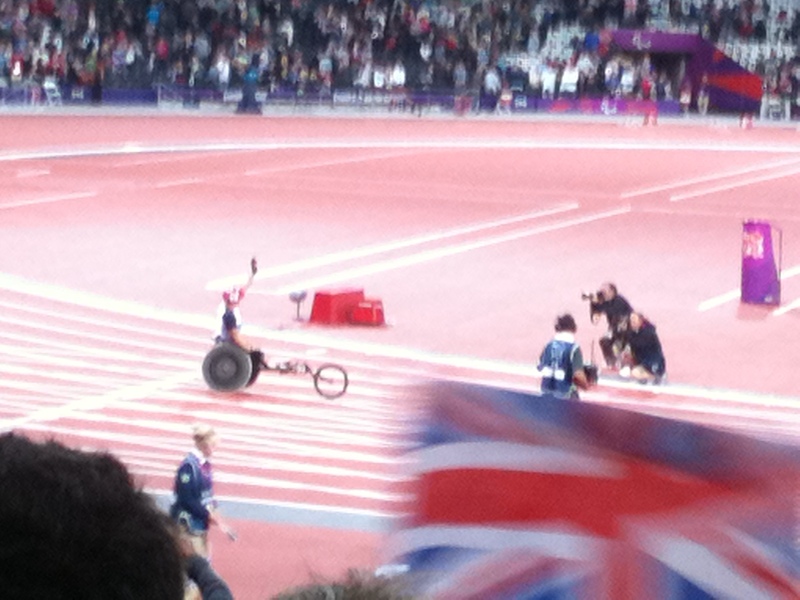 Here’s the first example we saw, with the winner the Brazilian Terezinha Guilhermina, in the women’s T11 200m. 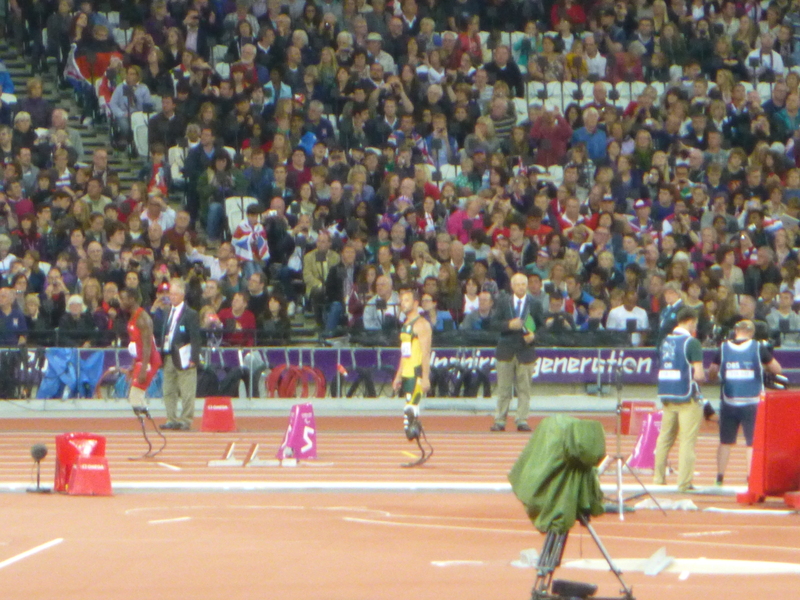 Graeme Ballard lined up for the men’s T36 100m. He got silver, pipped by Evgenii Shvetcov of Russia. 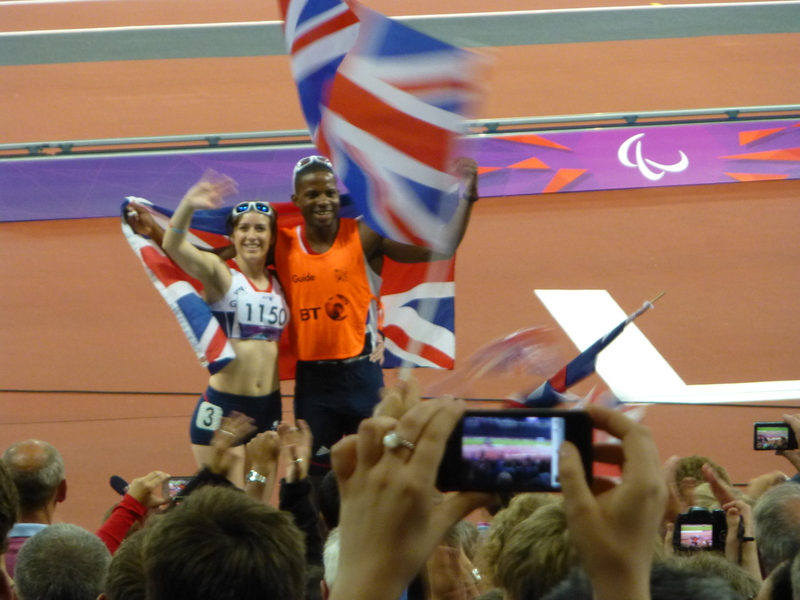 GB’s Libby Clegg won silver in the women’s T12 100m for visually impaired racers. A really popular result. First photo here is before the race, second after. 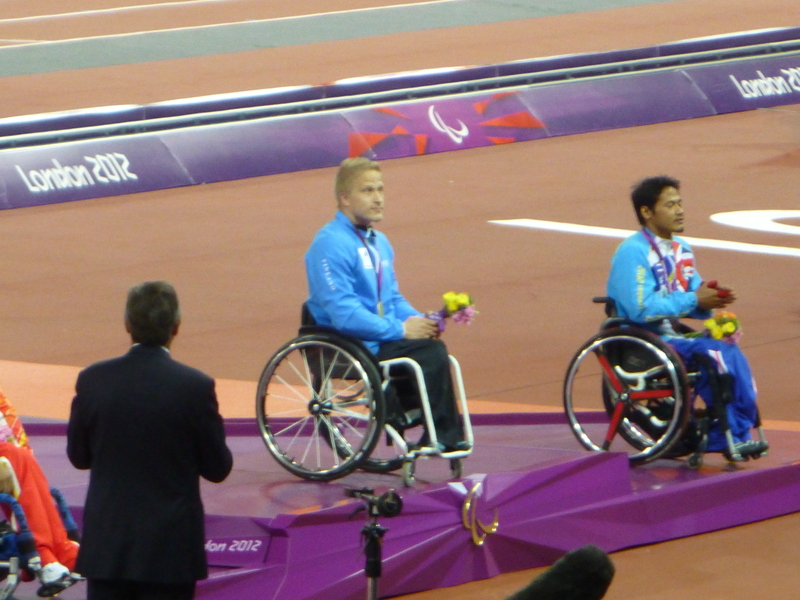 In the men’s T64 100m, which was a wheelchair race, the Finn Leo Pekka Tahti won, I think, for the fourth Paralympics in a row. Respect. 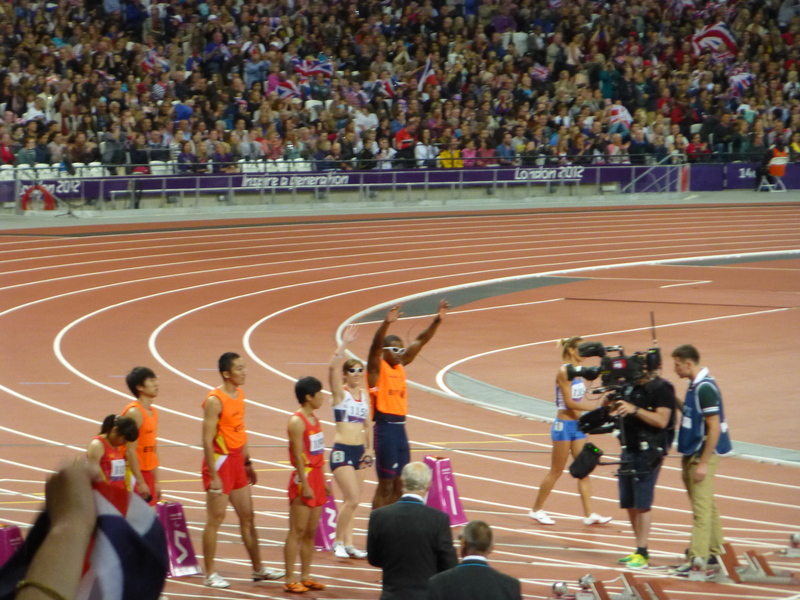 Lots of great races, but the first of the Big Two was the great man, Oscar Pistorius of South Africa, in the T44 200m. Tremendous excitement in the stadium. Pistorius is the first worldwide hero of Paralympics, and the man who crossed over and competed superbly in the Olympics 400m. This would be his crowning glory. A couple of shots. The side-on one, if nothing else, shows how fast they were going. But shock. 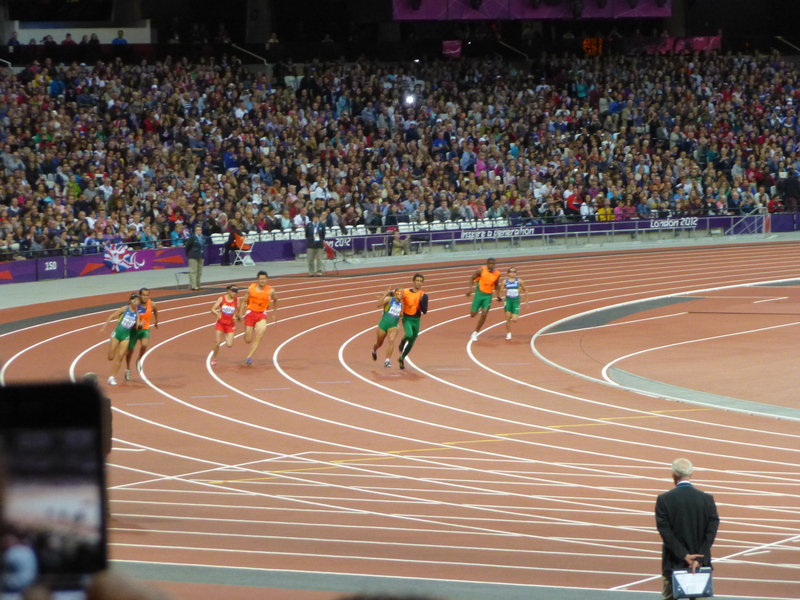 After leading so clearly, Pistorius was overtaken on the line by Alan Fouteles Cardoso Oliveira of Brazil (the guy in green, lying third in this shot). In the stadium we applauded the winner, and remained unaware that soon after Pistorius cast doubt on Oliveira’s blades. Great story for the media. Overshadowed everything else. On the one hand a shame. 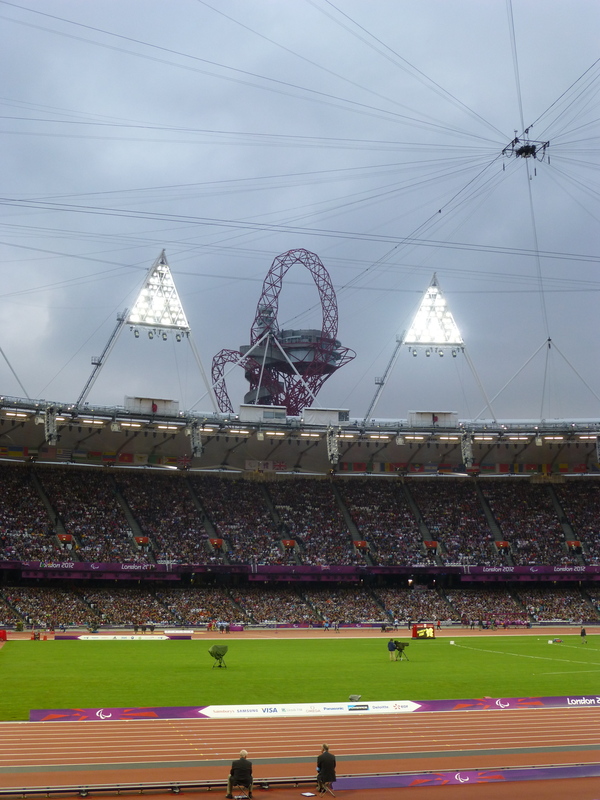 On the other, the controversy normalises the Paralympics. Gives it greater prominence in the headlines. Pity, but that is how the media operates. Jody Cundy’s outburst and Pistorius’ allegations were the headline moments. The Paralympics go mainstream. But then, the best moment of all. 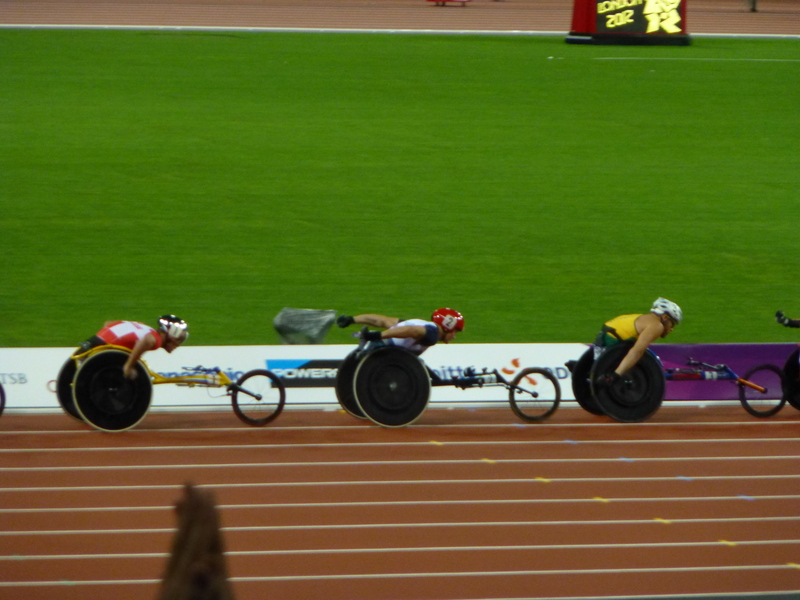 GB’s David Weir in the men’s T54 5000m. One of four races he is going for, from 800m to the Marathon. Yes, the Marathon! Talk about a combination of speed and endurance. And what a race! 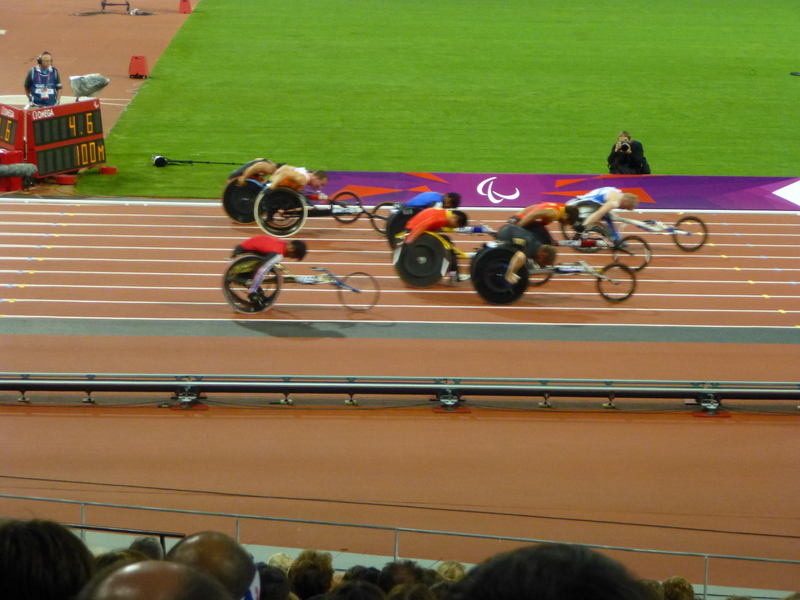 The wheel chairs are extraordinary, especially when they start moving at the speeds the athletes propel them. 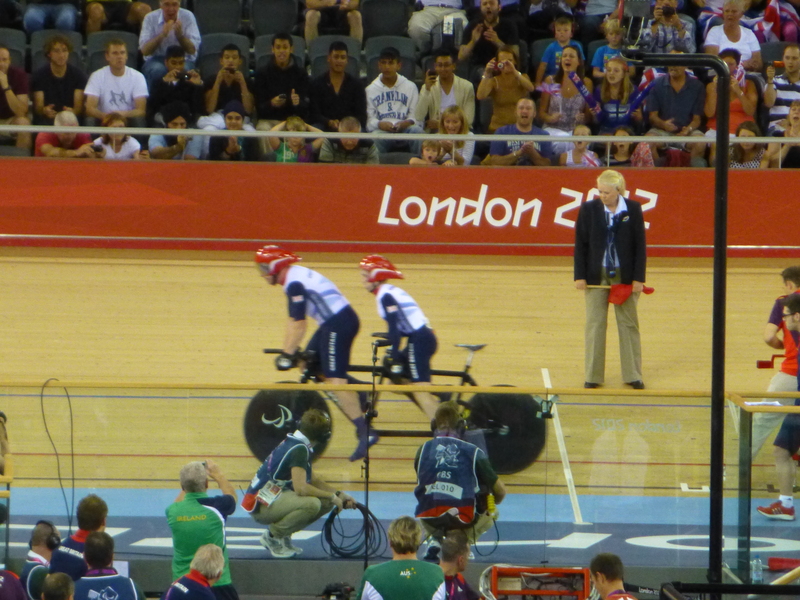 You almost think you are watching a form of cycling or something like go-karting. Having 5000m allows the race to ebb and flow, allows the tension, the anticipation, to build. And it did. The lead changed hands countless times. Early on I guess it was everyone doing their bit to keep the pace up. Later, it got very tactical. Weir lurked two or there back and then, on the final straight, pounced. And won! The crowd went crazy. 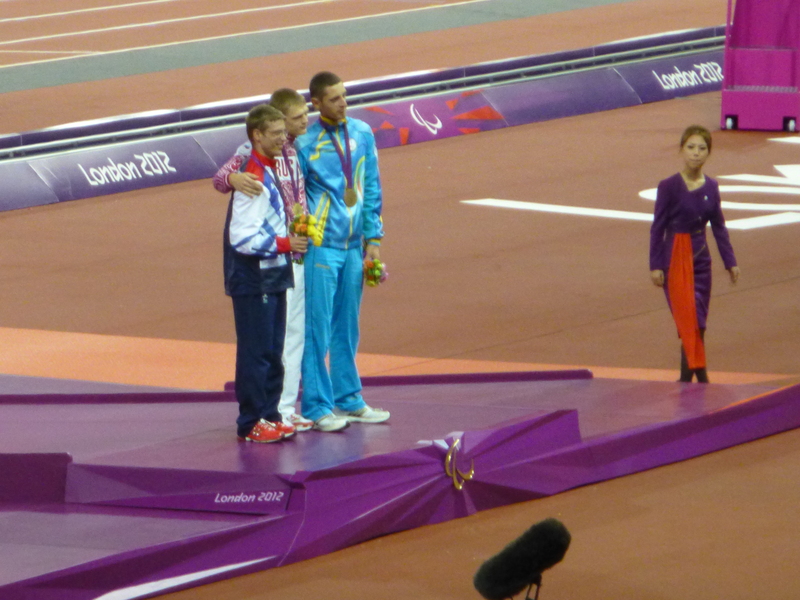 It was the Mo Farrar moment for the British Paralympics. Fantastic. We all went home happy after that! 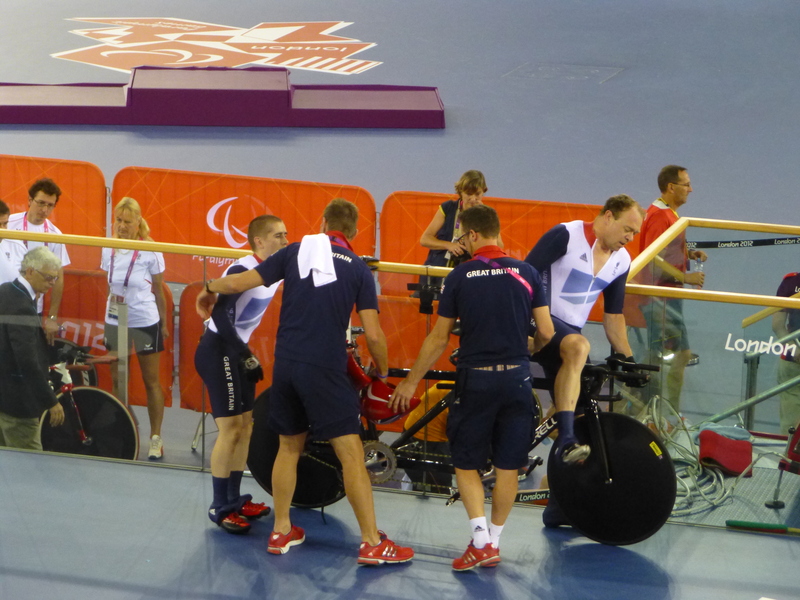 The positive feeling around the Paralympics is amazing. And Channel 4’s coverage has been excellent too. 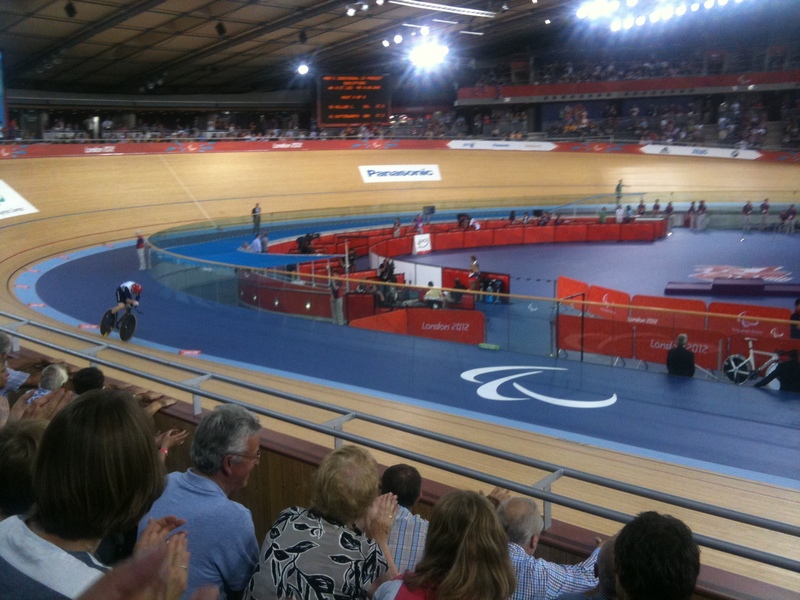 I’m no expert on Paralympic sport, but this must be a watershed for all the sports. The moment when people realised, hey, this is just great sport, and the fact that the participants have disabilities just makes it even more admirable. Rather than being an afterthought, a speciality. 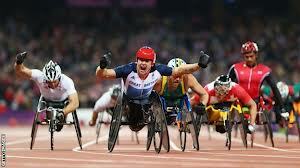 Since the weekend, the events have carried on thrilling, and David Weir has had another win, in the 1500m. More uproar in the stadium. And tomorrow we have one of the most anticipated showdowns. 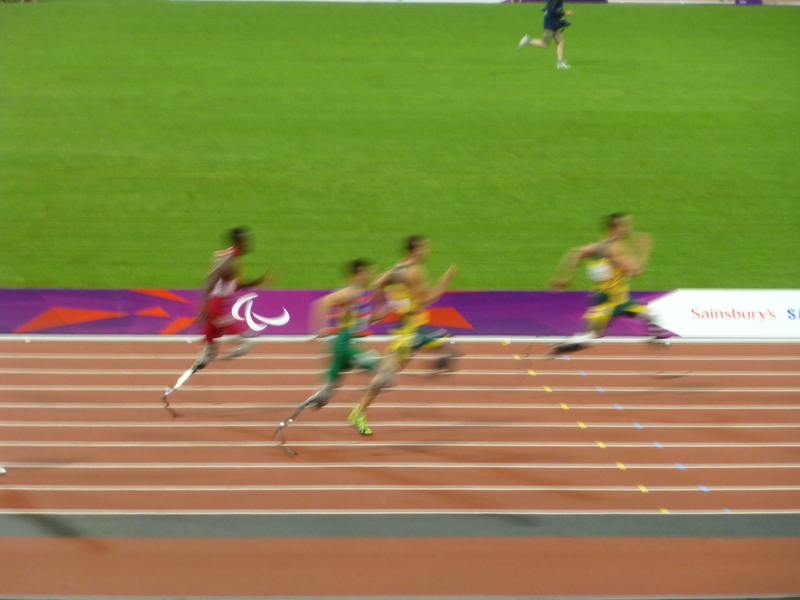 GB’s Jonny Peacock against Oscar Pistorius in the 100m. 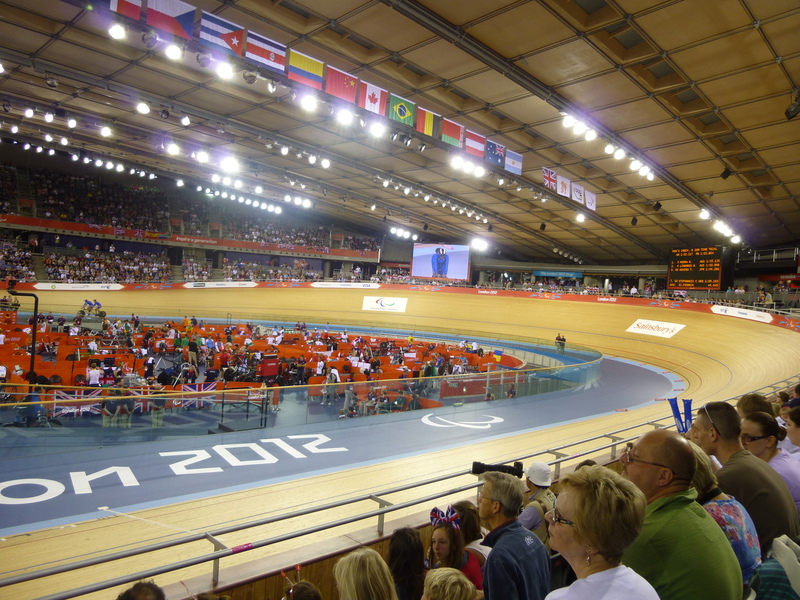 This entry was posted in Photos, Sportsthoughts and tagged David Weir, Graeme Ballard, Jody Cundy, Jon Allan Butterworth, Libby Clegg, London, London Olympics, London Olympics velodrome, Neil Fachie, Oscar Pistorius, Paralympics, Photography, photos. Bookmark the permalink.